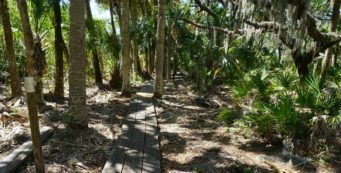 Holly Hammock Hiking Trail | Florida Hikes! 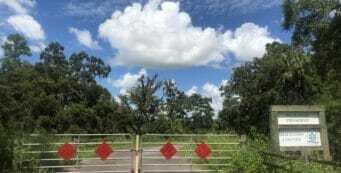 At the Ross Prairie Trailhead of the Cross Florida Greenway, there are two loop trails you can access – and this is the shorter of the two, taking you on a journey into the quiet woods of Ross Prairie State Forest, just south of the Greenway. The grasslands of Ross Prairie sprawl in arms and coves on both sides of SR 200, and you’ll explore their edges while keeping cool in the shady embrace of dense upland hammocks. This easy day hike leads you through a variety of habitats, including longleaf pine forest, scrub, and oak hammocks. In the summer, orchids dance amid the resurrection fern, and in spring and fall, the sandhills come alive with colorful wildflowers. 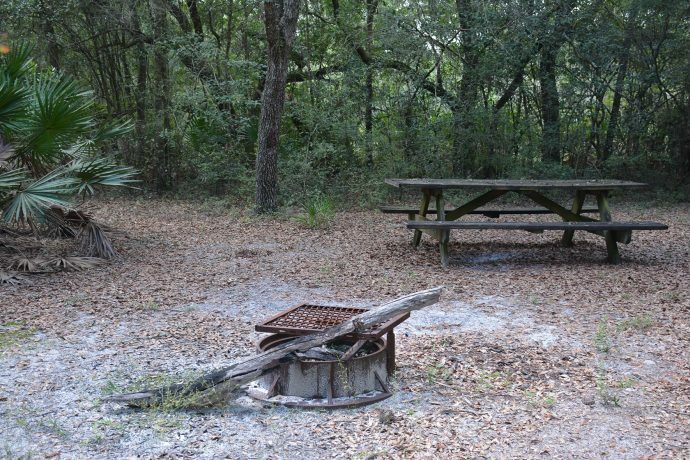 This 2.4 mile loop is part of the Florida State Forests Trailwalker program, and offers a primitive campsite perfect for introducing youngsters to backpacking. Restroom: at the trailhead. Flush toilets AND showers! Follow SR 200 south from Ocala, crossing CR 484. Look for the Ross Prairie Trailhead at the green sign 1.5 miles past CR 484 on the left. Follow the road around to park near the restrooms. 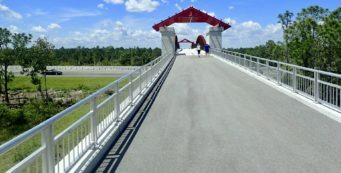 The trailhead offers an RV campground, access to equestrian trails, and another hiking trail, the 3.5-mile Ross Prairie Loop on the Cross Florida Greenway, which leads to the Florida Trail between Ross Prairie and SW 49th Ave.
0.0 > Start your hike at the Holly Hammock Hiking Trail sign near the parking area. It’s well marked, so you shouldn’t miss the gap in the fence. Walk along a narrow footpath through a deeply shaded oak hammock to the next fence, the boundary for Ross Prairie State Forest. The kiosk here shows the map of the trail. Cross the firebreak and follow the blue blazes into a forest of oaks, holly, and sparkleberry. 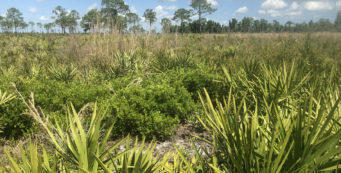 0.3 > As the trail rises up into the sandhills, longleaf pines tower over an open understory where colorful wildflowers peep out of the haze of wiregrass in spring and fall. 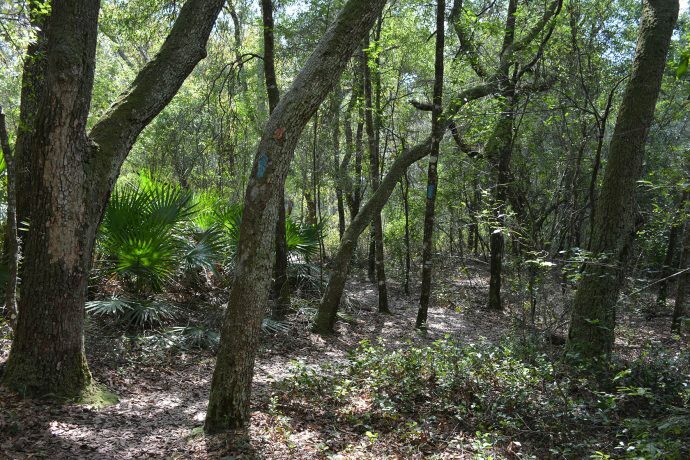 Descending downhill, you’ll find a scrub understory has swarmed into the sandhills, with silk bay showing off glistening leaves and sand live oak forming a low canopy. 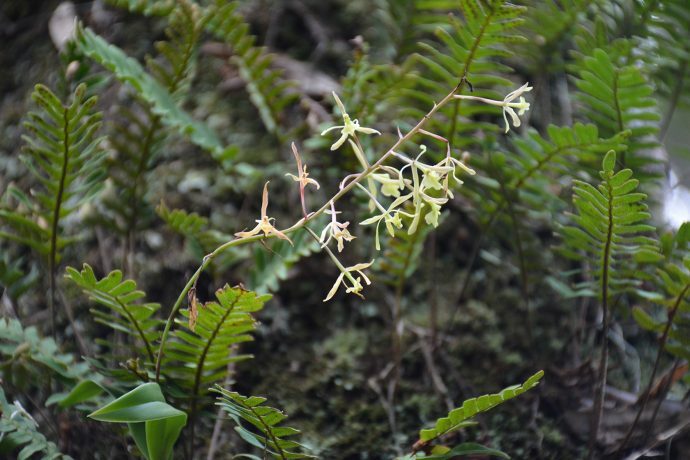 Look in the crooks of the branches for greenfly orchids, which bloom in summer. They’re tucked in between the dense blanket of resurrection fern on the branches. 0.6 > Emerging into the open, you reach an arm of Ross Prairie, the slope down into it the legacy of the cattle rancher who once owned this property. Turn right and follow this dike to the next “Hiking Trail” sign. Deer moss carpets the forest floor beneath the sand live oaks, and fingers of fungi rise through decaying leaves. 0.8 > Turning sharply left, the trail zigzags between ancient oaks to pop back out along the prairie. Turn right. This time, you walk past a sand pine that fell over and continues growing close to the ground. Turning right again, the trail enters the cool shade of the hardwood hammock. 0.9 > At the “Primitive Campsite” sign, lime green blazes lead down a side trail to an open spot beneath the cover of oaks. This is a simple camping spot, with a picnic table and fire ring and lots of flat places for pitching a tent. 1.0 > You start to see light through the trees as the footpath leads you out to a panorama along Ross Prairie, a treeline in the distance. Leave the marked trail to walk out into the prairie for the long view. 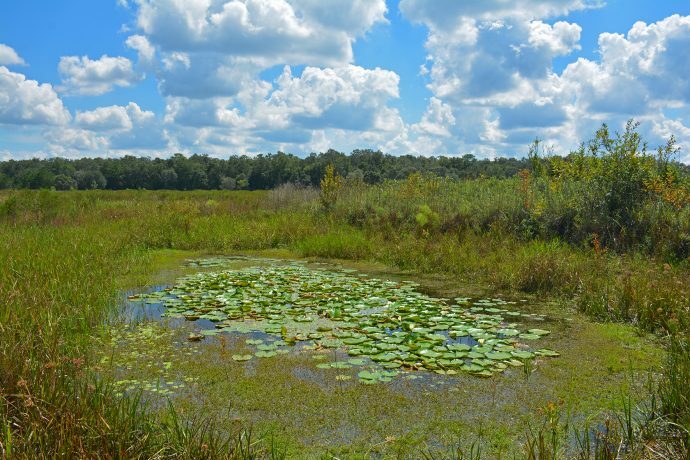 A well-beaten path leads to a water hole where American lotuses float on the inky water. Be cautious of alligators if you approach the pond. 1.1 > Back on the footpath, the trail makes a sharp turn here to return to the shade of the hammock, meandering past more large oaks. It ducks beneath thickets of sparkleberry and passes by healthy dahoon and American holly, the namesakes of this trail. 1.6 > Winding through the woods beneath the sand live oaks, the trail leads you through a gateway formed by oak trunks before it emerges again at the end of an arm of Ross Prairie. Those pink splashes you see in the grasses are pale meadow beauty. Cross a firebreak to re-enter the dense holly hammock. 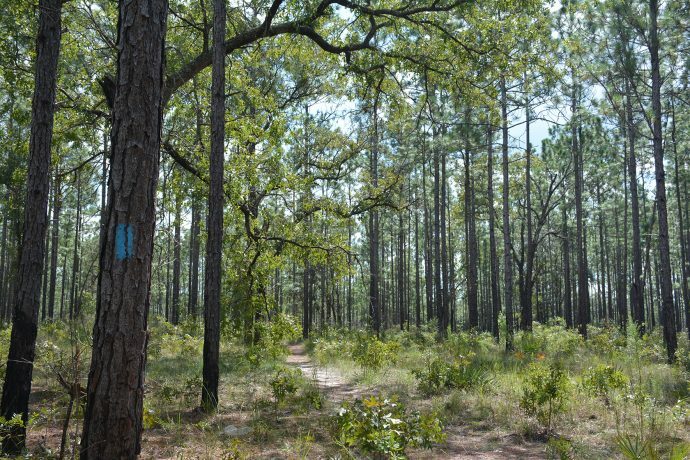 1.9 > As the trail continues uphill, you re-enter the forest of longleaf pines that tops it. Sprays of blazing star show off feathery pale purple blossoms in the fall. The trail quickly descends back into the hammock. 2.2 > A corridor of dense saw palmetto flanks the footpath. Off to the right, open prairie is visible beyond the screen of forest. The trail works its way out to the edge of that prairie and you see a fenceline. Turn left and you’ll see the kiosk at the beginning of the loop up ahead along the fence. 2.3 > At the kiosk, turn right to exit. When you get back to the parking area, you’ve walked 2.4 miles. Is there a printable file of this turn by turn descriptive of the Holly Hammock Trail available? I (the campground host at Ross Prairie) would like to have copies of this detailed routing of the trail to hand out to our guest that inquire about the trail, and how to follow it from start to finish. Once at our trailhead opening in the fence near our day-use parking lot, it would be wonderful for them to have this to take along to help guide them. I would also need your permission to hand these out since you are the author if I may. We are getting more and more inquiries each day about the routing of the trail as it becomes more and more popular. I do have some trail maps (aerial photos with the various Greenway trails marked out) that we provide our guest, but this detailed descriptive of Holly Hammock Trail would greatly compliment them. Hi, Gary! 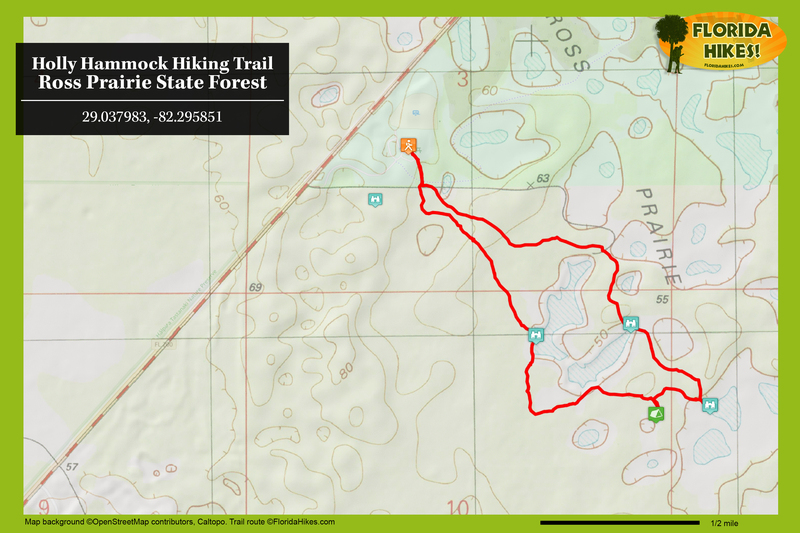 I’m thrilled to hear the trail is becoming more popular, as I was one of the two designers of the Holly Hammock Hiking Trail (along with Kenneth Smith). I used to live off 484 and maintain the FT from Ross Prairie to Pruitt. Let me think about how best to put together something that can be downloaded off this page and printed with permission. I wouldn’t do this for just any trail, but I have a lot of affection for this one. It will also be in the new edition of 50 Hikes in Central Florida. Thanks for the link! Honestly, the canal was an awful idea but the people who surveyed and planned it – starting with Robert E. Lee! – wouldn’t have had a clue why. 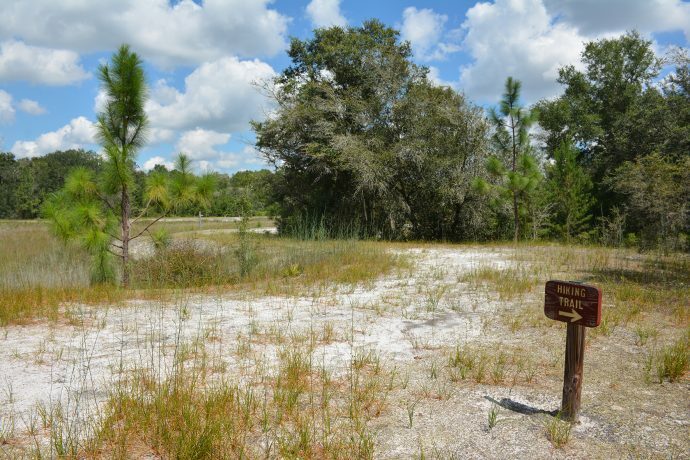 By the 1960s, the reason was finally understood: it would have messed with the Floridan aquifer (and Central Florida’s water supply) something fierce, especially with all the karst along the Ocala ridge. I recall there being a fuss when I was a kid that it would destroy Silver Springs, and I think that went a long way towards stopping the project. Thank goodness. Now the Greenway is an excellent idea!